Panasonic Professional Displays come with a standard 3 year warranty, which is upgradeable to 5 years. A 3 year parts, labour and logistics warranty for product failure. A collect and repair service at a local Service Centre. Access to our Professional Customer Support Centre - Covering all major European languages. The option to purchase warranty extensions to further safeguard your investment. Once a hardware failure is verified our authorised service partner will contact you to deliver a Swap unit, which we aim to provide within approximately two working days. Once unit has been received, please contact our Service Partner to arrange collection of the faulty unit. •Please retain the packaging from the Advanced Swap unit and ensure that you adequately pack the faulty unit using our packaging. Failure to pack correctly may result in a charge. •This Service does not cover demounting of the faulty product or installation of the Advanced Swap Unit. •This warranty is offered in addition to our default Standard return to base warranty, which is still available at your preference. 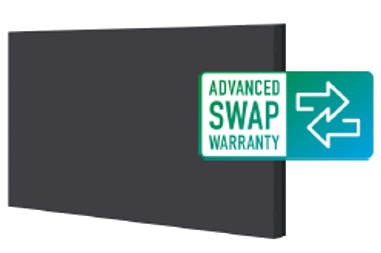 •This Advanced Swap Warranty is offered for all professional Displays sold after 1st February 2017.